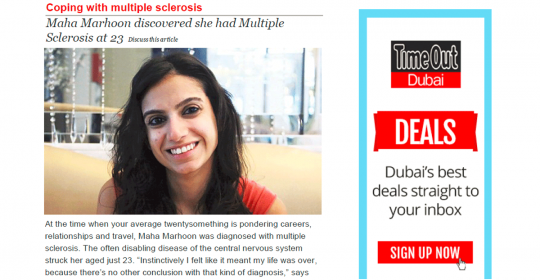 At the time when your average twentysomething is pondering careers, relationships and travel, Maha Marhoon was diagnosed with multiple sclerosis. The often disabling disease of the central nervous system struck her aged just 23. “Instinctively I felt like it meant my life was over, because there’s no other conclusion with that kind of diagnosis,” says Marhoon as she recalls the day of the diagnosis. Five years on, though, that initial despair has given way to renewed determination to help other sufferers in Dubai come to terms with their condition. 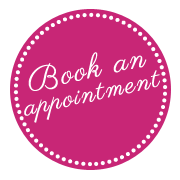 Marhoon has set up MS Talks, an open forum where newly diagnosed sufferers and those already living with multiple sclerosis can learn about the condition, and meet others. In conjunction with the German Neuroscience Center, the first event takes place on Saturday October 31, and she hopes it will become a regular event. 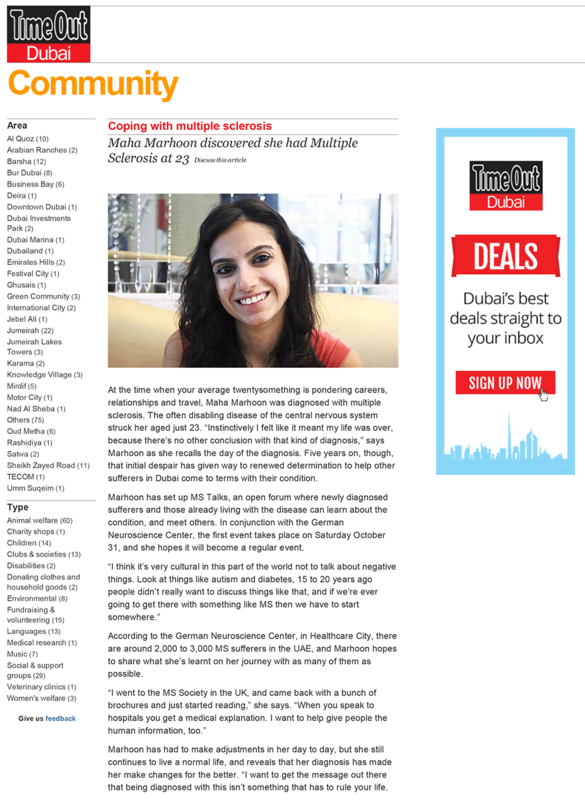 According to the German Neuroscience Center, in Healthcare City, there are around 2,000 to 3,000 multiple sclerosis sufferers in the UAE, and Marhoon hopes to share what she’s learnt on her journey with as many of them as possible. Free. October 31, 5pm-10pm. Urban Bistro, Dubai Media City. Email interestedmstalks@gmail.com to attend. While many people operate with some level of fatigue, it is also a primary a symptom of MS – especially in those who were otherwise active. For sufferers, the severe tiredness can be one of the most difficult daily symptoms to handle. The disease can be debilitating, but MS is not an “old person’s disease”. It commonly affects young people and is frequently diagnosed in people aged 20 to 40. The average onset age is between the ages of 28 and 31. There’s growing evidence to suggest people who are exposed to greater amounts of sunlight tend to have higher levels of vitamin D, which may help protect against immune-mediated diseases such as MS. It was previously thought that canine distemper, a virus carried by dogs, could cause MS. Medical research has proved that there’s no direct link between living with any household pets and developing MS.